Miss Stewart is the teacher for Class 4/dosbarth Laura Ashley whilst MrsC Brown is away on maternity leave. Mrs Garcia is our LSA and Mrs Lawrence takes us for RE on a Wednesday. Here is a brief outline of our topics that we will be studying in the Spring Term. Numeracy – We are following the Abacus Evolve Maths Scheme and during the Term we will be developing our number and place value skills. It is important that everyone learns their times tables (up to x12) as it will help your child with other areas of numeracy (fractions, percentages, division). There will be a tables test every Monday. Welsh –We will be learning about food and what we enjoy to eat. IT – Children will be encouraged to use the computers in the classroom as much as possible this term and a variety of activities and computer programs will be used to strengthen the children's confidence in using the computer in all subject areas. We will focus on importing and changing images this half term and using spreadsheets. PE –We are very lucky this half term as we will be visiting the Trelai Barn every Thursday morning where Mr Angove will teach hockey and I will teach dance. Please make sure that you bring a waterproof coat for the walk. After half term we will continue to have PE on a Thursday morning but it will be indoors at school. Homework – YR 4 - Alphabet project. Please continue with the alphabet projects. All children should have finished the following pages for these letters – A, C, P, R, S and Z. YR 5 – SPACE project! 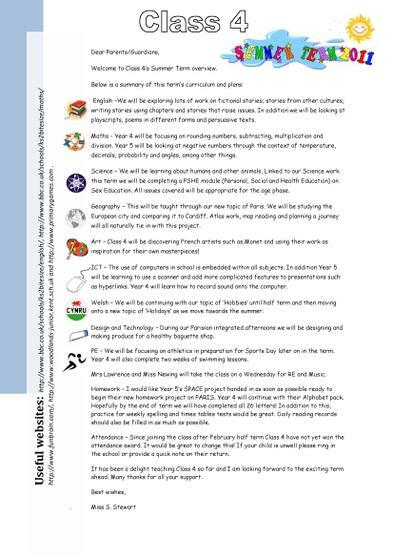 There will be a weekly spelling and times table test. Please remember to read daily and fill in the reading record books. After the success of the integrated afternoons last term we will continue to join classes 3 and 5 on a Monday, Thursday and Friday afternoons for our topic work based on SPACE. The children will have the opportunity to engage in a variety of focused activities led by members of staff. These activities include a Writers’ Workshop, Data Den (maths investigations), Action Research (children to research Space and beyond), Creative Corner (focused art work), Investigating and Problem Solving (Science investigations) and Lights, Camera, Action (oracy activity). We can ensure you that these activities have been carefully planned and the children are expected to visit every activity at least once during the half term. It is going to be a fun-packed term. Please feel free to see me if you have any queries or are interested in helping with our topic afternoons.